After going through the Mass Art in the metals program, Max went on that same year to enroll in the Cortiva Institute’s highly regarded massage therapy program. During his time at Cortiva, Max was exposed to a wide variety of different massage modalities and approaches to bodywork. Given his upbringing in a household of medical professionals, Max has always had a strong interest in physiology and medicine and felt a strong pull towards the more clinical styles of bodywork while at school. 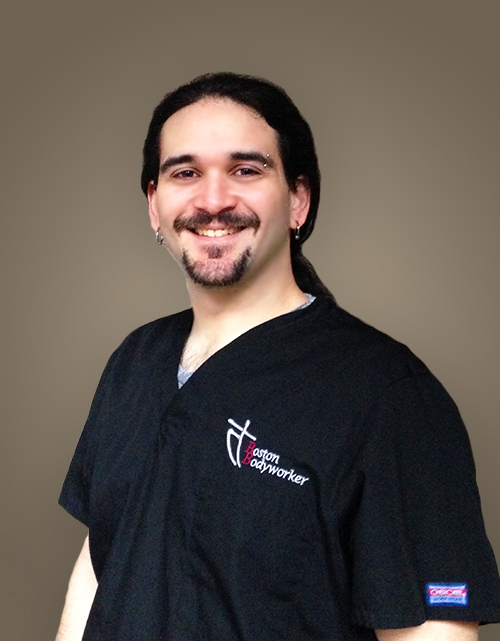 Max excels at Deep Tissue, Myofascial Release, and Trigger Point Therapy. He actively pursues a client base with injuries, soft tissue disorders, and postural distortions. Max has extensive experience working with a whole host of pathologies and soft tissue disorders such as fibromyalgia, spinal injuries and disorders, TMJ, sciatica, scoliosis, fascial disorders, and tears and sprains in ligaments, tendons, and muscles, to name a few. He also has extensive experience working with athletes and those who have physically demanding occupations such as construction workers, dancers, and martial arts practitioners. Max is able to work deeply and effectively, with the goal of re-balancing the body into a state of freedom of movement and reduced pain. He has a keen awareness of the way the body works as a whole and is particularly gifted at creating treatment plans centered around achieving your goal of reduced pain and improved wellness. In addition to doing massage, Max enjoys martial arts, writing, and traveling. One of his fondest periods of time in his life was the year he spent abroad, traveling across Europe and making memories and friendships to last a lifetime.